This is EXACTLY like the book If You Give a Mouse a Cookie, except different. The bulbs were replaced in the kitchen and over the table. All went well. No electrocution. No falling and not getting up. Then came the family room ceiling fan/light. Good gravy, it looked so straightforward. I’m a technical woman who can change a tire and install a ceiling fan with the best of ’em. I thought I was capable of changing one light bulb without peril. Not true. Carefully standing on the kitchen chair (not a rolling chair, mind you! ), I unscrewed the bottom cutesy bolt and tried to lower the globe in one fell swoop. There were these pesky pull chains with the wide dealie-bobs that hook them together that did not fit through the little holes in the bottom support plate. If I were an octopus, I could have done it. But I’m not. Then I had to stand their holding up the globe while my little assistant fed the chickens, changed their water, gathered eggs…..slower than a turtle riding on a slug’s back! She finally had the hens happy and pecking and she returned inside so I could hand her the light blub, each little pull cord piece, the fancy bolt screw, the support plate and eventually the burned out bulb. (Only AFTER she washed her hands to eliminate salmonella from spreading in amongst our family unit.) VOILA! Easy peasey! Yeah yeah, grasshopper, it all looks so simple. I replaced the bulb like a pro. BAM! Next I put the paper-thin glass globe back in place, but realized I needed to put the pull cords back together first. PHUN! That done, the globe went back up and I began the trying-not-to-swear job of feeding the little tiny chains through their little tiny holes in the support plate. The globe slipped and I caught it. Catastrophe averted. I painstakingly tried again and AGAIN to get the blasted chains in the stupid holes. The globe slipped again and I accidentally slammed it back up too hard in my haste and it cracked. Not a simple straight one-inch-long crack that could be crazy glued. It was a sophisticated nine-inch crack shaped like a question mark. Cool! Um, no. That sounds all nice and quaint and smart and all. 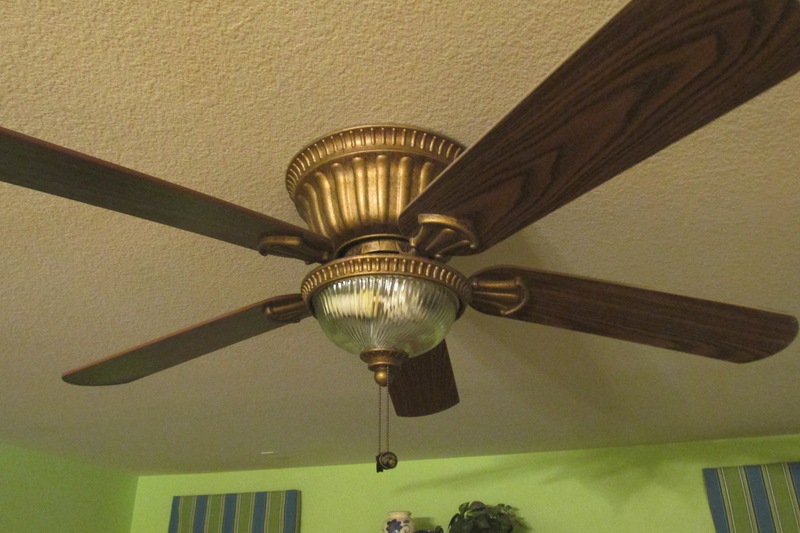 BUT, the center bolt in the ceiling fan was too long, so we had to replace it with the new one. Easy! The new light came with a fancy silver support plate and cutesy bolt that didn’t match. We decided to use the old gold ones, but there were no holes in the new globe for pull chains. So my husband got the wire cutters and cut them off. Just like that… no more variable speeds at the Crosby farm. Our fan is forever on high and the light is on BRIGHT! Those chains you see hanging there in the picture are placebo chains. If you ever come over to visit (or just to marvel at a hobo-Joe repair job), do not, I repeat, DO NOT pull on them. Use the light switch on the wall, please and thank you.